Have you ever tried to have a deep conversation with your teenager about the intimacies of relationships and had them say, “Mom! TMI!!!”? This felt like a regular response in those teen years with my children. There are just some topics that less information is more. I might have said the same to them if I had been more aware of the expression when they were young and telling me about their bathroom issues or other undesirable topics. TMI - Too Much Information - a phrase that can also be used when sharing about BNI to a prospect. 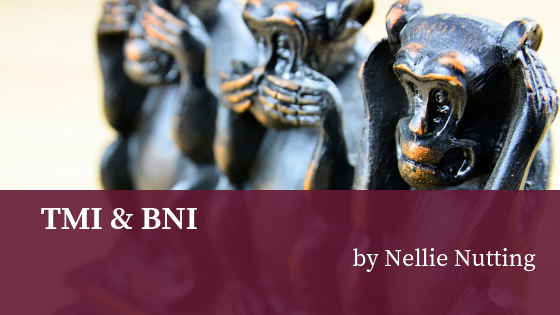 When I was first introduced to BNI, it was an invitation by a business owner who I knew, respected, and valued. So basically he invited me to check out this new group that was starting to bring community business owners together so they could work as a team to support each other’s businesses. They had an opening for my business classification. He said they were looking for someone who did what I did and he thought I might be a good representation for them to pass referrals to. He basically invited me to check it out - gave me the time, date, and place of the next meeting and asked if I could make it. That was it - simple. Not a hard sell. Not too much information. Just the basic details. Much as my teenagers had wished for during our past conversations! Would REFERRALS be helpful for you? If I were to INVITE you to a business group, who over time, would want to pass referrals to you, would you come? Just remember as you are inviting prospective members to your chapter, keep it simple. Go for the basics. Do not give TMI - let your team SHOW them the value of BNI for their business, and if they don’t see the value - well, they are not the right fit for your team. Happy Connecting!